Here's a new/old take on a VC Noise Source using the SN76477. 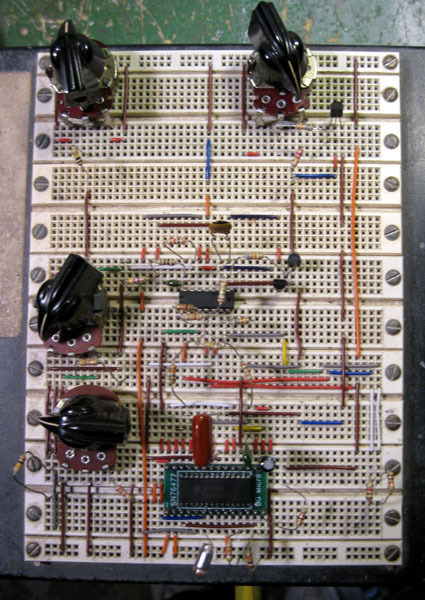 What's old is clocking the pseudo-random generator by the internal VCO of the chip. You'll see me doing that back in 1981 in the SuperController (see the reprint collection recently posted). The range is insane. On the low end it sounds like the last gasps of a Geiger counter. On the high end like the shrill scream of a radiator boiling over. Sweeping between the two extremes under ADSR control, say, is great for explosions or percussion. All this without tying up a VCF. And of course, everything is DC coupled, so it can also be used as a control voltage, too. This is particularly nice on the low, sub-sub-sonic end as a random source. The LFO is excellent and can run from 0.083 Hz to 125 Hz without range switching. Those are periods of 12 seconds to 8 mS.
You might wonder why I ignored some of the features of the SN76477. Well, it has a really stinky envelope generator suffering from truncation, the VCA has limited dynamic range, and the "mixer" is not all that useful. Instead, I chose to use the parts of the chip that work very well and jettison the rest. The result is what I think is a good quality circuit, yet quite elegant (if I do say myself). I've only built it on a breadboard so far, but offer it here in hopes someone else might breadboard and test it to confirm chip-to-chip variation is all taken care of. So, beta-testers, please step forward. One final thing. I've done a few unusual things with the power, so be sure to read the schematic very carefully! Watch out for the -15V on the LFO rate pot, and also observe how the +5V is generated by means of the internal Zener. And here are some sound samples, recorded flat. No EQ, VCF, reverb, etc. One more thing. You might note from the spec sheet that the Zener can only accept a max of +9V. Yet here I am using +15V. The secret is R3, a dropping resistor computed to match the current drain of the circuit. Never take "no" for an answer! If you decide to modify the circuit in any way, R3's value will need to be recalculated. Will it run on 12v OK, or would I need to change some values?